When the Hotel Statler opened in downtown Los Angeles in 1952, it was the largest post-depression construction project in the United States. One of the major features of the $25 million project was that its 13 stories were “entirely air conditioned” — the pinnacle of a modern hotel in the early ’50s. The Hotel Statler, later known as the Wilshire Grand, would become an L.A. cultural icon, hosting celebrities, politicians and businesspeople the world over. Yet, over time, its heating and cooling systems became so inefficient that not even a $20 million makeover could save the aging hotel, setting in motion the five-year construction of a new hotel, offices and retail space. A 73-story glass and steel skyscraper now stands in the footprint of the old hotel; its distinctive rooftop spire making it the tallest building west of Chicago. The $1.35-billion Wilshire Grand Center opened in 2017 to international acclaim for its sophistication and luxury, a skyline-changing icon of modern design and a catalyst for L.A.’s economic rebirth. The Wilshire Grand Center is also notable for achieving new levels of safety and sustainability, from its reinforced concrete core for earthquake and fire protection, to its radiant heating and cooling systems that use a fraction of the energy of a forced air system. In large-scale commercial building projects around the country, Xylem’s Bell & Gossett and A-C Fire Pump brands are integral to accomplishing energy goals through high-efficiency HVAC and plumbing system design, and ensuring the highest safety measures are in place for fire protection according to National Fire Protection Association (NFPA) 20 and local standards. Efficient use of energy within buildings is a primary focus of industry guidelines, such as ASHRAE 90.1, that have a direct impact on HVAC system design and installation. In addition, California’s Title 24 is a set of energy-efficiency rules that govern new building construction to improve water efficiency along with efficiency standards for mechanical systems. The Wilshire Grand Center design team, led by AC Martin Architects, worked with energy consultant Glumac to perform extensive energy modeling to design the glass façade, which informed the design of the HVAC and lighting systems — the two biggest energy users within a building. With an HVAC system accounting for as much as 50 percent of a commercial building’s energy use, designing efficient heating and cooling systems was critical to meeting the project’s sustainability goals. Working with AC Martin and general contractor Turner Construction Co., ACCO Engineered Systems completed the design of the hydronic HVAC system that would achieve LEED Gold status. The HVAC system features a central plant with high-efficiency chillers and condensing boilers that supply chilled and hot water to the 2.1-million-square-foot building. ACCO specified Bell & Gossett pumps and products for the Wilshire Grand’s HVAC system. The 1,100-foot-tall building is anchored by a seven-level podium structure that houses retail, restaurants, meeting rooms, ballrooms and a swimming pool. On top of the podium is 400,000 square feet of office space. podium and office levels, and standard working pressure VSX pumps serve the thermal energy storage system (TES) on the podium’s second level. The TES charges a large water tank overnight to reduce the number of chillers needed to operate the building during the day. Bell & Gossett AHRI 400 certified plate and frame heat exchangers isolate the building’s pressure zones from each other. Other Bell & Gossett equipment for the HVAC system includes air separators and expansion tanks that increase and decrease pressures in the hydronic system in response to changes in building temperature. The Intercontinental Los Angeles Downtown hotel, with about 900 rooms on floors 31 to 66, a 70th-floor sky lobby and bars and restaurants on floors 69 and 71, occupies the building’s tower structure. Inside the mechanical room on the 30th floor, 300 psig VSX pumps provide climate comfort to the hotel guest rooms via four pipe fan coil units and air handlers. From the rooftop’s open-air plaza on the 73rd floor, the views extend to the southern California coast 50 miles out. 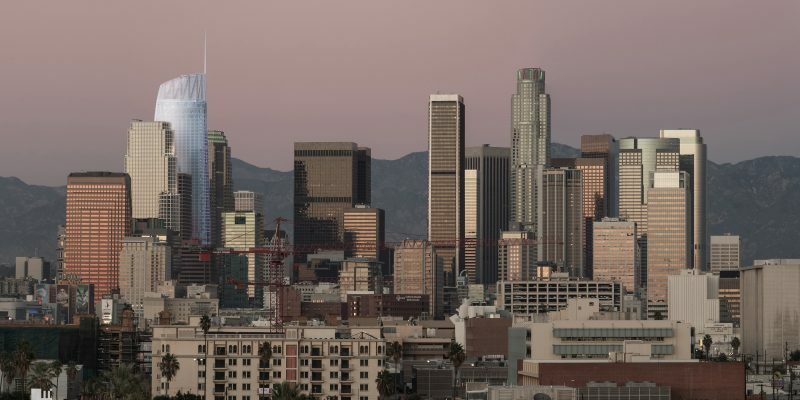 The roof design is one of the most talked-about features of the building, breaking with L.A.’s traditionally flat-roofed skyscrapers that are required to have helipads by city code. Wilshire Grand architects obtained an exemption from this 1970s rule reportedly because of the addition of other fire safety features that would exceed the city’s fire code requirements, such as the reinforced concrete central core that contains a staircase solely for the use of firefighters in the event of an emergency. Stringent L.A. and California building codes for fire safety and NFPA 20 Standard for the Installation of Stationary Pumps for Fire Protection — as well as project parameters — drove the design process. Brian Callahan, President of XL Fire Protection, accredited Certified Fire Protection Specialist (CFPS) by NFPA and level 4 certified NICET designer, sketched out a two-zone system that met the requirements for the high rise, worked within the space restraints of the fire pump room, and did not exceed maximum pressure requirements. “One pump services the low zone, but the high zone portion requires two pumps in series to create the 600 psi that was required. Once I knew the flow and pressure requirements, I was able to select the right combination of pumps to achieve that result,” said Starfire’s Paul Bennett. A-C Fire Pump vertical turbine pumps and A-C Fire Pump 8200 Series horizontal split case pumps were selected for the job. Codes require an exact set of redundant fire pumps on each level, so that meant six fire pumps in total. “By getting the number of pumps down to six, there was no need for an additional emergency generator, saving project cost,” Callahan said. Once the design was conceived, the team had to be sure the system would work as planned. “We had to do a lot of sizing and theoretical planning on what the pump curves would look like, especially in the high zone where the vertical turbines pump into the split case pumps and were approaching 600 psi,” Bennett said. That also becomes more complicated because of NFPA 20 requirements for fire pump impellers, which state the pressure at shutoff cannot exceed 140 percent of the rated pressure at the rated flow and can’t be below 65 percent at 150 percent of the rated flow. “One of the things we look at is not just the design point flow and head system needs, but also what the pressure is on the pump when it is at churn. We have to design the impeller to limit that pressure so that it is not overpressurizing the system components downstream of the pump,” Buscher said. The Wilshire Grand fire protection system design is also unique in the low zone pump room, with the vertical turbines sitting atop a 120,000-gallon three-story water tank in the second of five basement levels — with space at a premium on the site, there was no room for it outside the building. Designers had to be sure this setup would meet the NFPA 20 requirement on how tanks are constructed and that the fire pump would be capable of providing demand for the whole building in an emergency. In a project the size and scope of the Wilshire Grand Center, keeping to the timeline is vital to the project’s success. The construction site posed additional challenges — at just 2.8 acres, the site offered no space to store materials. Once HVAC and fire protection systems were in place, the next steps were to test the systems and train building personnel on their operation. On the fire protection side, the fire pump acceptance test was an essential step in obtaining the occupancy permit for the building. In testing the equipment, there was some fine-tuning in the time between turning on the pump and it feeding into the split case pump. By adjusting sequencing with the fire pump controller, the team was able to close the gap from 10 to 15 seconds at startup to just 7 seconds. The system also met the challenge of the 600 psi requirement. On the HVAC side, Dawson Co. conducted equipment training for maintenance and other personnel on the 18 Bell & Gossett products prior to the building opening. “It demonstrates the support that B&G brings to the table,” Masso said. With nearly two-dozen skyscrapers being built in city of Los Angeles, Korean Airlines’ Wilshire Grand Center likely won’t be the tallest building in L.A. for long. However, from its roots as a pinnacle of modern design, it stands tall as a symbol of the new way of thinking about commercial building, using an integrated design approach involving the fields of architecture, engineering and construction to achieve safety, efficiency and sustainability goals.